Recently I got given a very special new years gift from a friend of mine, a set of 3 different home brews. In getting such a present I promised that I would write up the products of his hop driven labours. So here it comes, the first of the three beers in the Home Brew Edition. Malt: Pale, Crystal and Cara Wheat. 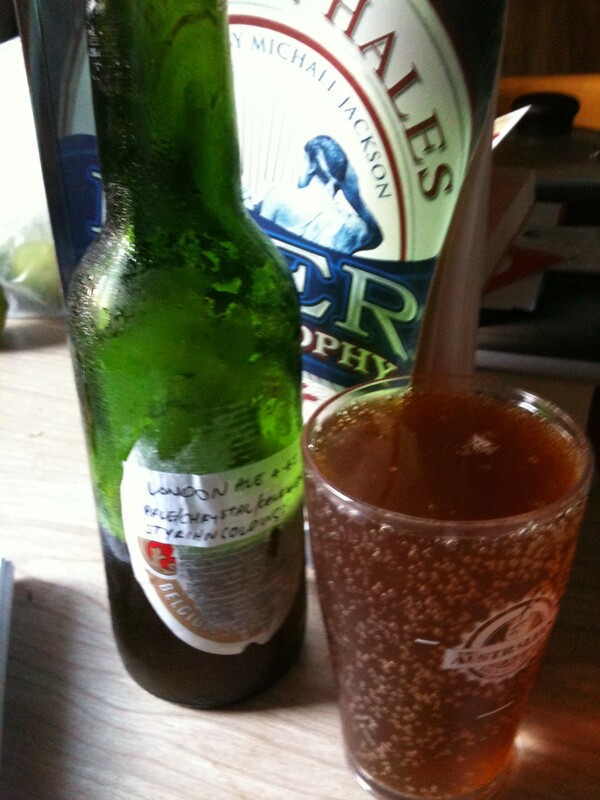 This was an imitation of the Wells and Youngs Real London Ale and did a really good job of it. The choice of malts produced a darker, browner kind of beer closer to a traditional British Brown Ale in appearance. The choice of a wheat malt in the form of the Cara wheat added some extra mouth feel and darker colour when used with the Crystal malt. The Pale Malt drives the chemical action of the beer. The Styrian Goldings hops are native of Slovenia or Styrian, a southern province of Austria. They are not related to Goldings or East Kent Goldings, The Austrians who took the hops over thought they were but in truth they were much more closely related to Fuggles. The Styrian Goldings are slightly spicy and often used in English beers or in dry hopping near the end of the brew. The beer definitely brings a strong aroma of stone fruit and a very satisfying whiff of ripe tropical passionfruits and pineapples that streaks just in front of a twinge of spiciness. The beer itself has a very short head life but it foamed beautifully out the neck of the bottle when I pried the lid off. The beer is unfiltered and tumbles into the glass a hazy shade of copper. When pouring it I had to be careful in order to make sure that too much of the yeast didn’t drain into the beer. I don’t care who you are, big chunks of floating yeast are rarely appetizing. Until next time beer lovers. ← What would you like to see?